Pulled ham hock in wholgrain mustard sauce with buttery potato crush, chantenay carrots and cut green beans. 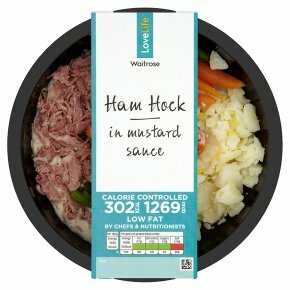 INGREDIENTS: potato, carrot, Ham Hock (13%) (pork, salt, antioxidant (sodium ascorbate), maize dextrose, preservatives (sodium nitrite, potassium nitrate)), green beans, milk, water, onion, single cream (milk), white wine, butter (milk), cornflour, rapeseed oil, mustard seeds, pork extract, fortified wheat flour (wheat flour, calcium carbonate, iron, niacin, thiamin), wheat flour, spirit vinegar, salt, pork gelatine, garlic purée, brown sugar, white pepper, maize starch, onion concentrate, garlic concentrate, tomato purée. Stir before serving.. Do not reheat once cooled. Stir before serving. Do not reheat once cooled.